Stays true to the original SingStar experience with fully-licensed tracks and videos from the world’s leading stars. The Blu-ray disc features 30 tracks by Gwen Stefani, OutKast, Coldplay, Pussycat Dolls, Razorlight and many more. Select and sing the songs you want from the SingStore. The SingStore will be open for business from December 7th with 44 songs to download, including great songs from the SingStar range plus new tracks from The Manic Street Preachers, Zutons & Depeche Mode. This is only the beginning as further songs will be added regularly from 17 December onwards to build the ultimate SingStar resource for every mood and every party. 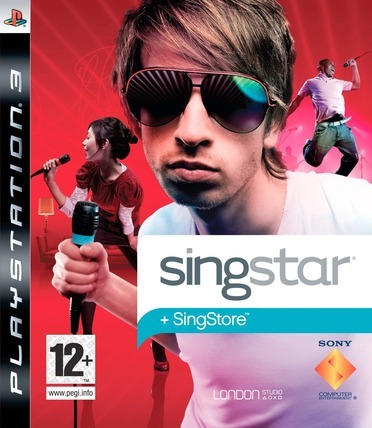 Continue to play whilst your favourite songs download in the background: now you can go to the SingStore and choose your very favorite SingStar songs to bring out the performer in you - from an RRP of £0.99 per track. The result is the ultimate playlist with absolutely no fillers! Customisable: new menu skins and backgrounds, plus new voice effects and wallpapers to make it your SingStar. Slick new look: the visual style has evolved with a new look that nonetheless remains true to SingStar’s heritage and familiar to SingStar fans. Same game experience that everyone knows and loves: take centre stage and sing your heart out alone, get your group together or go head-to-head in competitive singing fun with all your mates. Enjoy brand new technology that enables you to reduce the volume of the original song – if you’re feeling brave enough! My SingStar Online: get involved in the all new SingStar in-game community! Here users can upload & share their SingStar photos, videos, parties and performances. Build an online SingStar profile, rate videos, check out the latest and highest rated. Fun everywhere with www.singstargame.com:upload the highlights of that party onto singstargame.com and share the entertainment with friends and colleagues on your PC after the party is over. Rate performances, find out what’s hot and what’s not, and have fun!